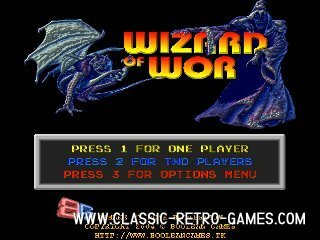 Wizard of Wor is a 1980 Arcade game by Midway. In this (multiplayer) game you have to defeat all monsters in each maze. The game was ported to Commodore64, Atari 2600 and Bally Astrocade later on. This remake is made to run on Windows. Currently rated: 4.8 / 5 stars by 57 gamers.